Planning your federal retirement? You need to know that Federal Employees have unique financial planning needs that most generic financial planning doesn’t address. One of those unique needs has to do with your retirement income. It will start, stop and change in ways that will not compute in most financial planning calculators. But understanding *how* your income will change is a critical part of your retirement plan. Let’s take a closer look at how your federal retirement income will start, stop and change through your retirement – and why it creates a critical gap that most federal employees don’t see coming. Federal Employees under the FERS system will have to deal with the most stops, starts and changes in federal retirement income. The biggest source of this change in your federal retirement income revolves around the FERS Supplement – we’ll get to that in a moment. The first phase in your federal retirement income starts after retirement. Many (but not all) FERS will have two sources of fixed income coming in during this time… your FERS retirement pension and the FERS Supplement. While the FERS Supplement can be a wonderful benefit – it’s important to know that it will stop at age 62. And it stops whether or not you have started Social Security. When you read OPM’s Handbook, Chapter 51 on the Retiree Annuity Supplment (aka FERS Supplement) – you’ll see that it says the Supplement stops once you are *eligible* for Social Security benefits. So even while many FERS don’t start Social Security at age 62 – their FERS Supplement will stop because they are *eligible* to receive Social Security at age 62. The FERS Supplement will stop, even if you don’t *start* receiving Social Security benefits until later. Even so, many FERS decide to delay starting Social Security until they reach their Full Social Security retirement age (between 65 and 67). This creates a unique ‘gap’ in your fixed income once the FERS Supplement stops, but before you start Social Security. So for this phase, your FERS pension continues, but your FERS Supplement stops at age 62. The final phase comes when you start drawing your Social Security benefits. Let’s say you’re a FERS, and you retire under MRA+30 rules. We’ll say your MRA was age 56. So at age 56 you retire and start receiving your FERS Pension. For easy numbers, let’s say your FERS pension is $2,000/month. At 56, you’re too young for Social Security. But you qualify to receive the FERS Supplement, and we’ll say it brings in $750/month. But the FERS Supplement will stop when you reach age 62. And again, it doesn’t matter if you haven’t started Social Security – the Supplement stops no matter what when you reach age 62. But even so – it may make sense to delay starting Social Security until your Full Social Security Age (Between 65 and 67). If you’re MRA is 56, your Full Social Security Age is likely between 66 and 67. For our example, we’ll say it’s age 66. This creates a critical ‘gap’ in fixed income from age 62 to 66. Once you reach age 66, you may choose to turn on your Social Security – and now finally, you have all of your fixed income streams coming in – 10 years after you retired. Let’s continue our example, and look at your fixed income in phases. Now let’s take this one step further, and compare your fixed income to how much you plan to spend in retirement. Say you plan to live on $5,000/month in retirement. How do these changes in retirement income affect you? You have fixed income of $2,750/month, but need $5,000/month. $5,000 – $2,750 = Gap of $2,250/month. You have fixed income of $2,000/month, but need $5,000/month. $5,000 – $2,000 = Gap of $3,000/month. You have fixed income of $3,200/month, but need $5,000/month. $5,000 – $3,200 = Gap of $1,800/month. 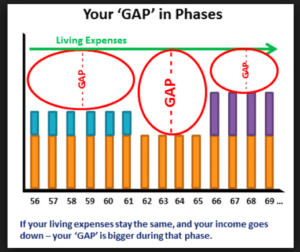 You can see that you have a much bigger ‘gap’ to fill from age 62 until you reach age 66. Many Federal Employees may be tempted to turn on Social Security at age 62 to try to fill this gap. And while that might make the gap smaller in the short term – it might not always be the best answer. They could actually be losing out in the long term by trying to address a short term need. for retirement as a Federal Employee. We’ve just looked at the unique ways your federal retirement income changes – but you need to know that most retirement calculators are not designed to have income start and stop in retirement. They can’t ‘show’ this gap in your income, and so they can’t make accurate calculations that account for how it affects your retirement plans. Not only does your federal retirement income change in unique ways – it also increases differently. Because your retirement income may not be increased by COLA right away. Federal employees under the old CSRS system do see a COLA right away. But most Federal employees are now under FERS, and most FERS won’t see a retirement COLA until age 62. This means that if you were receiving $2,000/month when you retired at age 56 – you’ll still be receiving $2,000/month until you’re 62. Once you reach age 62, then you’ll start to receive COLA, but only from that point forward. So if the COLA that year was 2%, then when you’re 62, your pension would be $2,000 + 2% COLA = $2,040/month. This just confuses the heck out of standard retirement planning software. Most retirement projection programs have a field for you to enter in an estimated rate of COLA for retirement income – but if you look carefully, you’ll see that that COLA is almost always applied right at retirement. But if you’re a FERS, this is not the way your federal benefits work. This is an important reason why you need to make sure you understand your benefits. Most generic programs for financial planning for retirement can’t compute your unique benefits – but if you don’t know that – you might make decisions based on the results that could not turn out to be in your best interest. There’s more to know about your retirement income and how it changes than we can cover in this one page. And once you get the basic concept, it’s important to add in inflation and COLA and see how it affects you.